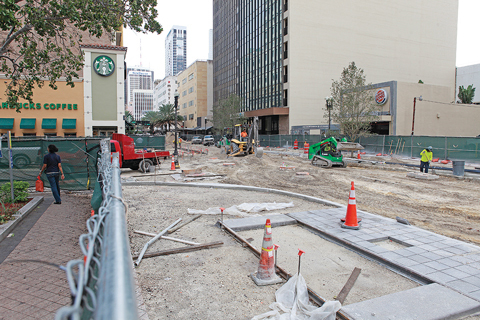 Prospects for the Flagler Street renovation – which has dragged on several years – are suddenly brighter, as leaders of Miami-Dade County, Miami, and the Downtown Development Authority pledged to pump more money into the project. There was general agreement that the plan was better than its predecessor. The changes would take about 36 months to complete with the current contractor, and 42 months if a new request for proposals has to be issued, he said then. It would only affect the curbs and roadway; the sidewalks would remain the same, he added. But the new plan costs a lot more. Authority directors heard Friday that the new budget will be $27.572 million, the shortfall created by the new plan would be $10.34 million, and the project will probably take four more years. Miami-Dade Mayor Carlos Gimenez has volunteered $3.8 million from the county, said Ken Russell, authority chair and Miami commissioner. Chris Rose, Miami budget director, and Nzeribe Ihekwaba, assistant city manager and chief of operations, came up with another proposal. “The city can provide additional funds, but not the entire $10.34 million, or even the $6.54 million [remaining] after the county’s $3.8 million is applied,” said a document distributed to authority directors. “This is a phenomenal development,” said Neisen Kasdin, authority vice chair and office-managing partner of Akerman LLP. He co-chairs the Flagler Street Task Force with Brian Alonso, a real estate investor. Directors voted that the downtown authority will contribute the requested $250,000 per year for four years, beginning this fiscal year, but no more than that. “Make sure the resolution says, ‘But that’s it!’,” Mr. Russell told Barnaby Min, assistant city attorney, to laughter from the group. I can’t wait until this work is complete on Flagler. Many businesses are losing money or closing because customers cannot get to the stores. This has gone on for years.